Below is our January coupon code which expires – you guessed it – at the end of January. Use code NEWY for $4.00 off any order of $40.00 or more. Start shopping now! Customize a tank top for the bride! And you can also customize tank tops for every other person attending a brilliant and beautiful bachelorette bananza. Did You Get Engaged on Christmas? Get Your Future Mrs. Shirt Today! Buying Christmas presents for your girlfriend can be a challenge. It’s expensive. It requires a lot of careful consideration. It needs to really pop. That’s why we recommend the simple path: an engagement ring. Skip all the hectic gift shopping of the holiday season. Just get a ring! And it’s so easy to wrap! Honestly, you probably don’t even have to wrap it. Just drop to one knee and hand it over. 2. I have even more shopping advice. 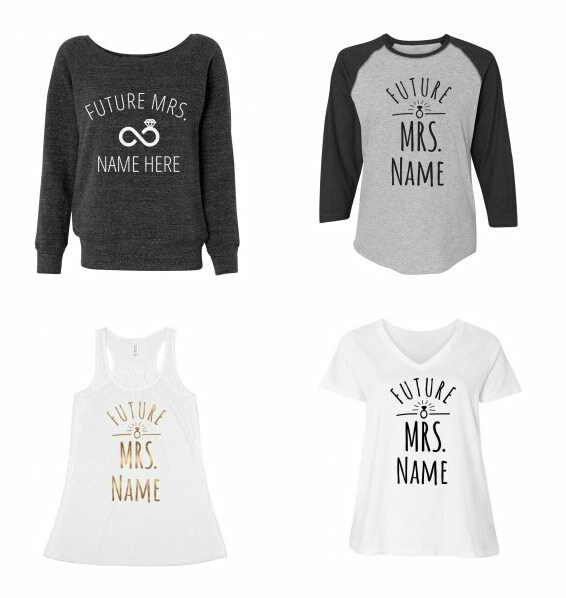 Show your new fiance how thrilled you are by getting a custom shirt, tank, or sweater that says “Future Mrs. Last Name Here”. But don’t get one that actually says Last Name Here. Personalize it with his last name. From Adams to Zigler, you can add any last name you want. Or, even better, does he have a fun nickname that everyone loves? For example, let’s say your friends affectionately call your soon-to-be husband Frank The Tank. How hilarious would it be if you got a sweater that said “Future Mrs. The Tank”? It would be very funny. He would love it. I would love it. See all of our Future Mrs. Shirts here.